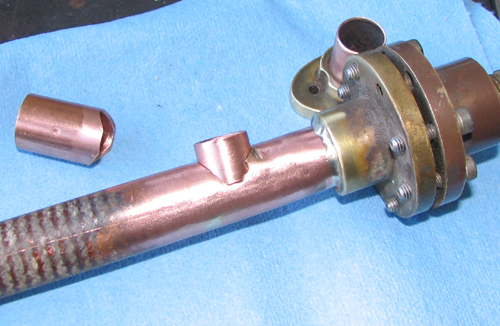 Interesting month; went to several shows, worked on a couple of art cars, did some more work on the steam engine exhaust manifold and finally got myself a new welder. 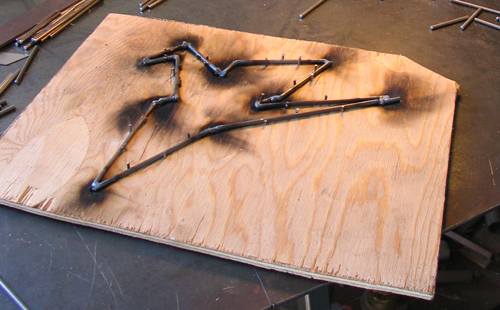 Photo #1: This was the month I got to test my skillset with my TIG torch. No doubt about it: I've got a ways to go! 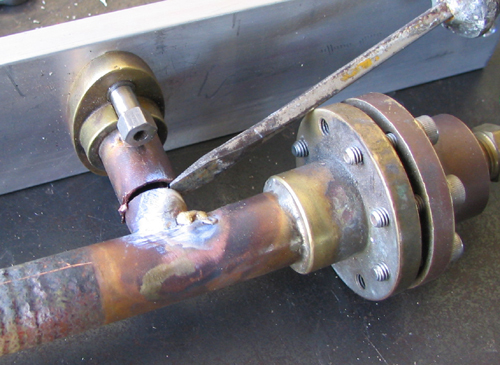 Here's a wonderfully botched job in my first attempt at TIG brazing. I think I picked the wrong flux... The manifold is affixed to an alignment jig which I had the foresight to build, so I can still repair the damage and get something that will fit the engine. Photo #2: The final solution: I fabricated a double-sleeve arrangement and I'll silver solder it together in two goes, first with some higher temp silver solder to attach the inner sleeve, followed by lower temperature silver solder for the outer, which will slide on the inner one and interface with the flange fitting that will bolt to the engine. 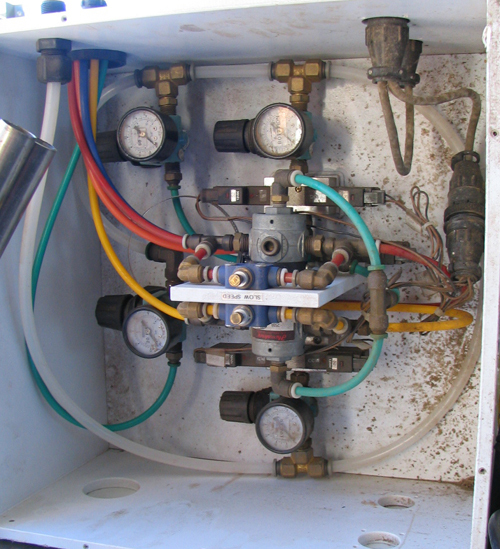 Part of this mess happened because the air-acetylene torch that I like to use was rendered inoperable by mud wasps who got into the torch tip and plugged up the orifice! Replacement parts were hard to find so I took a whack at TIG. But now after a month and more new parts have arrived. 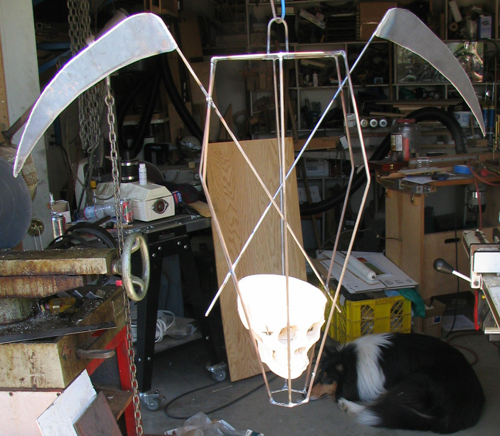 Off the steam engine project and back to the art car, as time grew short: Burning Man only a month away! Photo #3: Ah, more to my liking! After beating myself to death with the silver brazing dilemma and while awaiting still more torch parts I got to work on my pal Gothalot's art car. 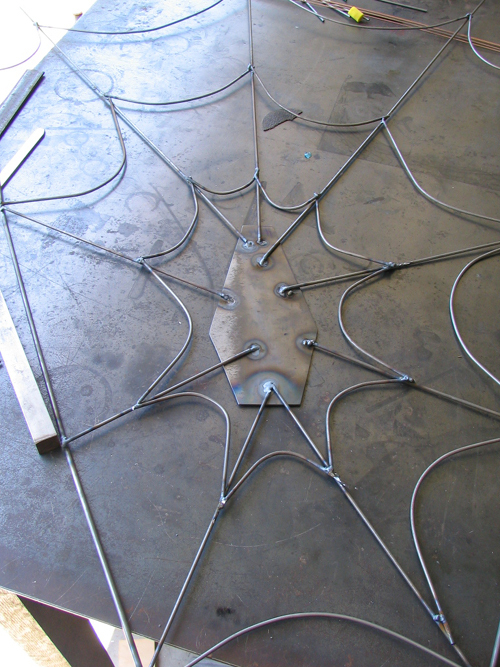 Here is a jig he made to hold short bits of 1/8" steel rod that form a "spider web" design that will be affixed to various parts of his very gothy art car Clarisse, aka the Blood Vessel. 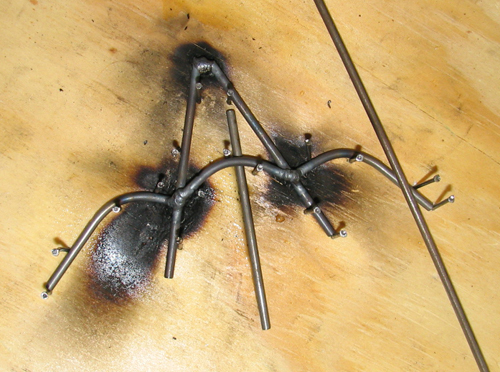 The long length of wire on the right was used to attach a ground. Photo #4: Not your average hood ornament! I made this cage out of 3/16" dia steel rod. Gothalot made the sickles out of 1/16" sheet steel, with a plasma torch and a shitload of grinding. Once completed the cage was festooned with electroluminescent wire and the skull was topped with an plastic illuminated beating heart, courtesy of the local joke shop. Heh. Photo #6: Yet another plywood jig; this one to weld up numerous profiles of origami cranes. I found it helped to keep a spray bottle of water nearby, lest the jig catch fire and burn up before I got all the parts done! 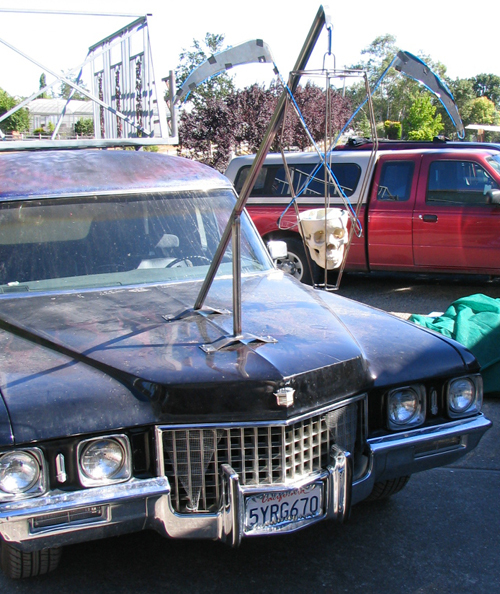 Photo #8:This monster is a '71 Cadillac hearse, becoming heavily modified and making a superb art car! Note second floor (done by a professional weldor, something I'm not!) and the trial fitting of the hood ornament.